Former military spy Judd Ryder is walking in his own Washington, D.C. neighborhood when he spots someone coming out the front door of his home―who looks just like him, and is wearing his clothes. Just as Ryder starts to trail him, the imposter is killed in a hit-and-run that’s no accident. Was the man the intended victim, or Ryder himself? The story begins on 9 August 1945, a date marking the end of the Japanese Empire and the end of WWII. USS Maxwell (DD 525), flagship of Destroyer Squadron 77 is part of a group of cruisers and destroyers protecting the battleship Iowa, which, after a day of shelling Hitachi, Japan, is withdrawing to the east. What is so important about the date? At 1102 hours Nagasaki, Japan was destroyed by the United States’ second atomic bomb, and Japan was forced to face defeat — but terms of surrender take time to arrange, providing ample opportunities for mischief and intrigue by our ally Joseph Stalin et. al. As the sun sets on this fateful day, Commander Todd Ingram, the exhausted captain of the Maxwell, and Captain Jeremiah T. (Boom Boom) Landa, the squadron’s commodore, are standing n Maxwell’s bridge watching the sunset. Word of the second atomic bomb has reached the fleet, and everyone is wondering if the war is finally over. Joseph Stalin knew Japan has to surrender, and he makes a last minute grab for a piece of the Empire’s pie. Maxwell’s executive officer, Lieutenant Commander Eldon (Tubby) White, enters the bridge with a message. The Soviet Union has declared war on Japan, invaded Mongolia, and plans to occupy one of the main Japanese islands. The author weaves a complex tale encompassing the remainder of 1945, starting with events leading up to Japan’s formal surrender. A surrender opposed by elements of the Japanese military because surrendering violated the code of bushido. After the formal surrender, Ingram is sent on a top secret mission without being told its real purpose, and finds himself a pawn in a game between the NKVD and the OSS, with guidance (misguidance?) provided by the State Department. During the mission and afterwards, he encounters Soviet duplicity. In addition to naval action, the tale includes a double agent, two love stories, and lots of intrigue. Edge of Valor is a story built around real events and historical facts — Japanese Unit 731 for example. Interplay between characters is reminiscent of books authored by W.E.B. Griffin. 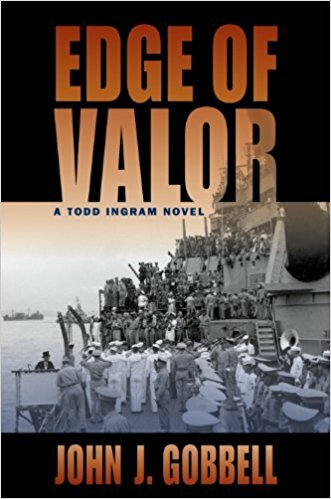 Edge of Valor is the fifth novel in the Todd Ingram series, which presents the author with a dilemma—how much of the story already told must be retold? In the case of Edge of Valor, the author thankfully provided a list of names and titles at the front of the book. A list I found very helpful. This is an excellent, accurate, well-written and plotted historical novel. I highly recommend Edge of Valor. EDGE OF VALOR is the fifth thriller by John J. Gobbell featuring the World War II exploits of Cdr. Todd Ingram, commanding officer of the destroyer USS Maxwell (DD 525) who saves his ship when it is hit by a kamikaze off Okinawa. For repairs, they pull into Kerama Rhetto, Okinawa, where they receive news of the war’s end. Ingram expects to be shipped home like the rest of his crew but instead receives orders to fly to Manila, where he is met by Brig. Gen. Otis Dewitt, an Army buddy from his days on Corregidor who is now intelligence aide to Gen. Richard K. Sutherland, chief of staff to General MacArthur. On Ingram’s C-54 are sixteen Japanese senior military and civilian diplomats who meet with Sutherland to discuss formal surrender arrangements. Two days later the terms are settled and Ingram is working with one of the Japanese delegates to ensure that mines laid in Tokyo Bay are neutralized, allowing for safe passage of more than two hundred Allied ships. While Ingram is promised that he can attend the surrender ceremony on board the USS Missouri (BB 63), DeWitt, in concert with the State Department, has an ulterior motive and sends Ingram to Karafuto (Sakhalin Island, according to Soviet maps) to defuse a Soviet attack on Hokkaido, the northernmost home island of Japan. Ingram’s old adversary, Edward Dezhnev, is the brigade commander responsible for laying siege to a Japanese holdout garrison in Toro, a natural jumping-off place for an attack on Hokkaido. Also in Toro, DeWitt explains, is Walter Boring, a Red Cross representative holding two crates of overwhelming photographic evidence of Japan’s experiments on live human beings in China. Ingram is expected to return with those crates, but how can he when Boring is being protected by the Japanese garrison in Toro, where Dezhnev and his troops stand ready to overpower them at any moment? As his shipmates prepare to return to their loved ones, Ingram’s war continues. Three weeks earlier he had been fighting the Japanese, and the Russians were supposed to be friends. Now he doesn’t know whom to trust. David Andrew Westwood has written another historical fiction about the impact of war on people in Emmersmitz, 1938. It is the story of three adventurous young British girls who set out to have an adventure with old family friends in Austria. It is a revealing portrait of the changes on society caused by political ambition and war. The girls find their old friends will not be friends in the future. Along the way one young lady finds love, loses it, but saves a national Jewish treasure that she didn't even fully comprehend. It is a good book and highly recommended to lovers of history, especially military history. Over the summer of 1938, three spoilt English girls take a trip to Austria to visit the sons of family friends. They hope to recreate the enjoyment of the boys’ visit to Britain two years earlier, but in the intervening two years things have changed, and for the worse. Austria has voted to become part of Germany, a Third Reich run by an ever-increasingly powerful Hitler. Even the small Austrian town of Emmerspitz is affected by the spread of Nazism, and it seems that everyone there has their secrets. Without meaning to, the girls discover the darker side of their friends’ lives, and the mountain itself hides the largest secret of all. David Andrew Westwood tells a story about a young man who lies about his age to fight for his beliefs and country in World War I. The story follows him through his youth, made complicated by his physical challenge, with all its ups and downs. The story melds the impact of war on families, the horrors of "modern warfare" in the first major world war, and the results of the war on those fighting it. It is emotional, intriguing and well written. I highly recommend this novel for anyone seeking a better understanding of the world's environment and the pain of battle during the period over which World War I occurred. Arthur Wheatcroft, a hearing-impaired teen who works with his father on New Zealand’s railways, is content to sit out the war in the belief that he is not wanted. But his experience with trains is needed at the front, and he is recruited to train in England as an officer in the Royal Engineers. In a town on the River Somme in France, schoolteacher and widow Anneliese Palyart is preparing to evacuate her frightened pupils to a small village away from the fighting. She has lost not only her husband to the war but also her will to live, and she holds no real hope that they will survive. Meanwhile, General Major of German artillery Ernst Fleischer has been in the forefront of attacks across Belgium, and now it is France’s turn to face his cannon’s wrath. He intends to annihilate anything that stands in the way of his armor and his ambition. All three are destined to meet on the latest battlefield: Charentin. But why is Arthur found wearing a German uniform and denied a British military burial? All the superlative clichés used in describing extraordinary thrillers are applicable to “Secret Assault” – action packed, exciting, spellbinding, suspenseful, infighting -- just to list a few. Well written, this military thriller kept me up well into the night because I couldn’t put it down until its end. The characters are well defined and realistic. Author Don Helin, an Army veteran with years of service in the Pentagon, captures the reader from the start as he describes the shooting of the National Security Adviser, a retiring four-star general, at a Washington area hotel. The general’s protégé, Army Colonel Zack Kelly chases the shooter, a Vietnamese man who is killed in traffic as he tries to escape. Kelly soon learns that several other retired generals and two retired sergeants major has been assassinated or are targeted. A common thread connecting the victims is service with the Americal Division in Vietnam about the time of the My Lai massacre. Although working in the nation’s capital, Kelly’s military background includes extensive special operations service, which enhances his ability to rapidly adjust to the face-paced, white knuckled events threatening Vietnam veterans. As Army, FBI and Washington area police investigators search for the assassins, personal tragedy hits Kelly in an unrelated situation. An old nemesis kidnaps Kelly’s daughter as a ploy to make the colonel suffer a horrific fate for ruining the kidnapper’s career and putting him in prison. 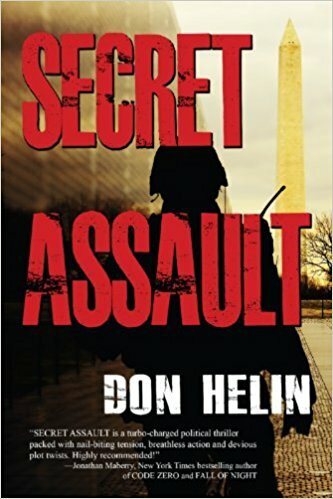 “Secret Assault” is a sequel to Helin’s acclaimed “Devil’s Den” published in 2013.